There was one thing i forgot to mention in my last Kat Von D review and that was her "Unlock-It Makeup Remover Wipes". 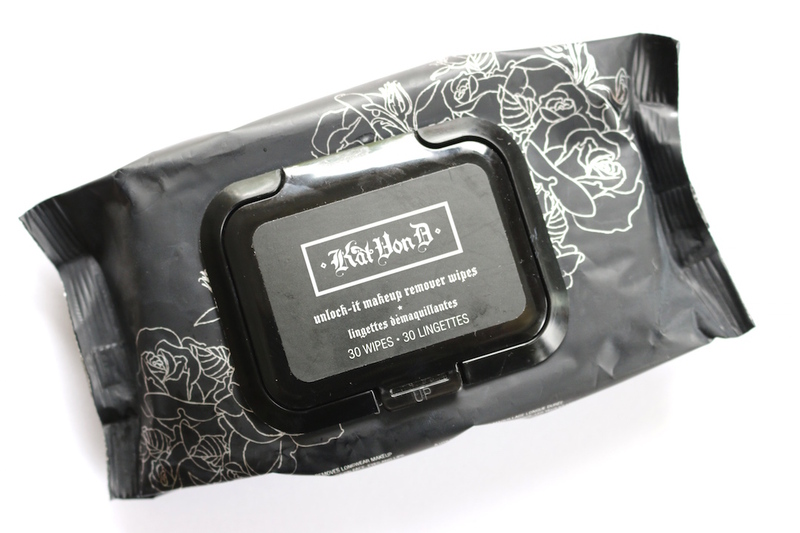 Kat Von D isn't one of those celebrities who throws her name on anything and calls it good, her line is cohesive and represents her, so it makes sense that these wipes are tough enough to remove the full coverage, long-wear products she puts out there. If you love the convenience of face wipes but haven't found anything that quite cuts it at removing your full coverage makeup, this might just be your new secret weapon! The cloths themselves are very durable and i've yet to put my finger through them so you really can use the entire cloth to remove every last scrap of makeup. The formula is gentle enough to use around the eyes but tough enough to really remove all waterproof makeup. These aren't cheap by any means but if you know you need something convenient to remove bold makeup once in a while, this might be a good treat product to have on hand! And perhaps the ultimate testament to their power; these are what i used to remove my recent ICP makeup! You can find the rest of the vegan Kat Von D products here on Logical Harmony's list.